CHRISTMAS with the optional Technique Twist of using glitter and/or shimmer. Our generous sponsored is Uniko Studios. Uniko is offering a prize for the winner and also a random draw from amongst those entries who include the twist. We are very pleased that Valentyna of Flourishtina will be joining us as Guest Designer for this challenge, and she will also be back next week for our reminder post. Valentyna is a wonderfully talented papercraft artist. Please head on over to her blog for some wonderful inspiration. 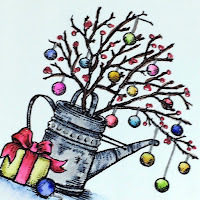 This beautiful image and sentiment is from a gorgeous set of Christmas stamps by Marcella Hawley of Power Poppy. Marcella is a lovely person, and an incredible artist. You really are in for a treat when you visit her store and her blog. I water colored Marcella's wonderful image with my Zigs, then added lots of clear Wink Of Stella to give it sparkle and shine. I could not, for the life of me, capture that sparkle and shine on camera. I even tried a closeup photo from a different angle. No twinkle to be seen. Please take my word for it! LOL. Any and all suggestions on a technique that works for this are welcome! To finish, I distressed the edged of the water colored panel, and mounted it on SU Brushed Silver card stock (retired). The Time Out Design Team members have created some awesome pieces for your inspiration. Please head over to the Time Out Challenge Blog, take a look and leave the DT some love. Then take some Time Out to play with us! Beautfiful card, Stephanie! This is a wonderful image (have to check out the store!) and I love your simple take for the card, this really looks so lovely. Great coloring too! Wonderful water colouring and I do love this sweet image. I like the distress edge, I always forget to do this. I can never catch the sparkle. Anita has managed it well this week, perhaps she has a few tips. A beautiful image! (Love that it is not that traditional) and s o beautfully coloured! Hope you have a colorfull week! 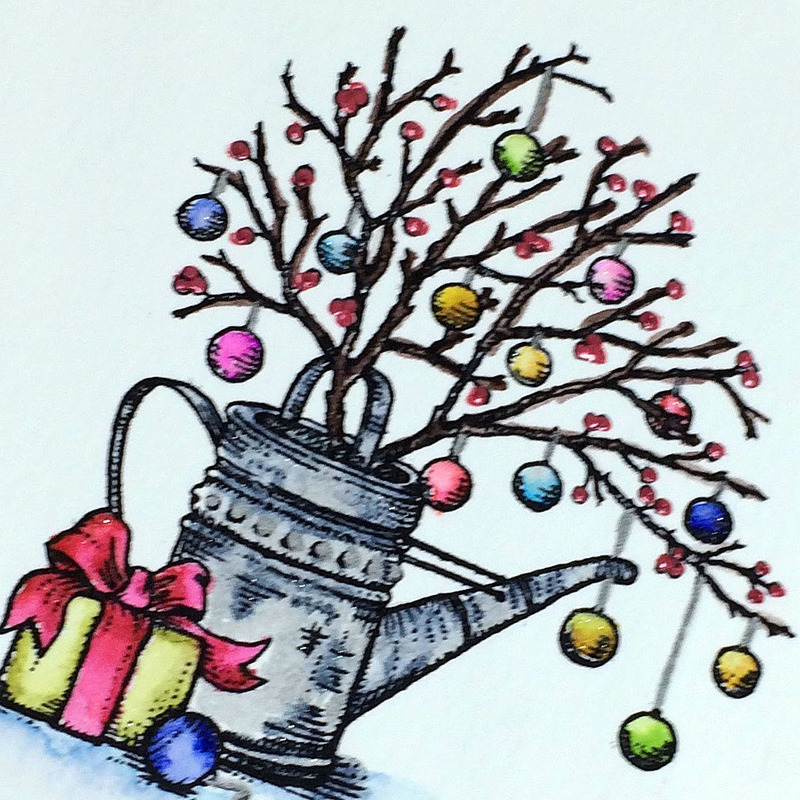 She does have some wonderful designs, and this one is so pretty all colored up on your card! Lovely card Stephanie! Beautiful coloring--love the lightly distressed edges! What a darling image, perfectly colored. I believe you on the shimmer. I hope you had a fantastic Thanksgiving! What a gorgeous image, and your coloring is wonderful! I love the silver card that reflects the metal watering can. I'm sure the shimmer is awesome! A pretty image that you've elevated to gorgeous! Love those ornaments! Stephanie can I just tell you how happy I am you are showing Power Poppy Love!! Its a wonderful company and you've done it proud wth this gorgeous card. Sublime!!! 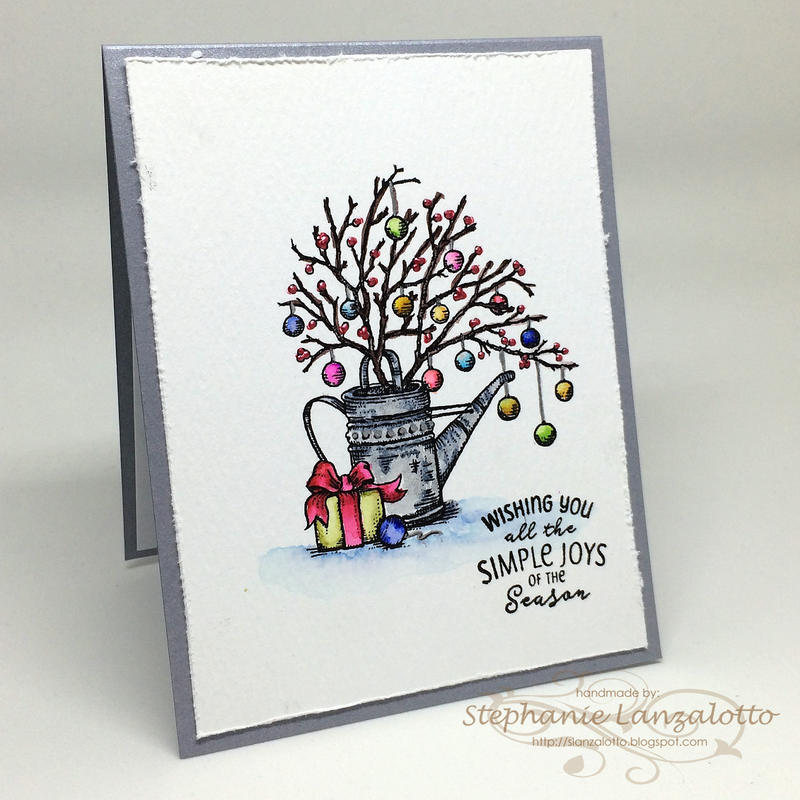 Happy Little Stampers New Release Blog Hop!